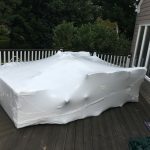 NYC Shrink Wrapping provides Residential Shrink Wrapping, Commercial Shrink Wrapping, Outdoor Patio Furniture Wrapping, Vehicle Wrapping, and other Shrink Wrapping Services in Staten Island, NY. Also serving all other areas of New York City. For furniture wrapping and covering in Staten Island, NY, look no further than NYC Shrink Wrapping. NYC Shrink Wrapping provides patio furniture wrapping throughout Staten Island. Contact us today for a free quote. When it comes time to put away your outdoor furniture let NYC Shrink Wrapping protect your investment and keep your furniture looking new. We specialize in furniture covering in New York City.